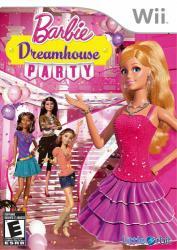 Explore the Dreamhouse and play through fabulous mini-games as Barbie and her friends. Raquelle flipped a switch in the Dreamhouse that turned every room into a party game! Barbie and her friends must play their way through the house and turn things back to normal. Explore the Dreamhouse and play fun mini games. Collect fab fashions to dress and style Barbie and her friends.